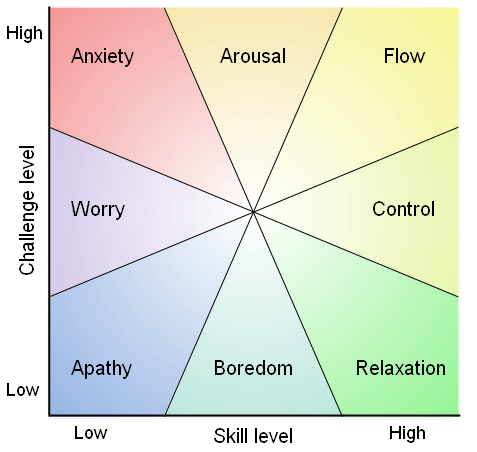 Being in the flow is arguably the most perfect state to work from. It is a state where your awareness of time almost disappears and you are one with what you do. Although this perfect harmony usually feels effortless, it is the mental state where we produce our greatest results. So you could say flow is the state where peak performance happens. If we could willingly get into The Zone, how the flow state is also called, especially among athletes, we could use this great state anytime we would want to produce something outstanding. But how can we get into The Zone? When your mind is your main-processor, your focus is your computer screen. Your mental focus determines where you put your attention and your time. So if you don’t take active control to direct your focus, you risk wasting your ressources. Unless you want to relax, it is much better to set your mental focus on something worthwhile. Another great benefit of controlling your mental focus is to focus on the good side of life and not so much on the bad side. It sounds funny but our reality is really what we perceive it to be. If you focus on what’s good in your life, your personal goals and what you love your perception of your life will follow. On the other hand you can take your focus away from negative people, news or simple distraction that won’t help you in your personal life. Flow happens only when you do something challenging. If it’s boring or too easy to do you just can’t reach that special state, at least that was the finding of Mihály Csíkszentmihályi in his concept of flow. You also need to do something that requires your highest skill level, something that you really can do very well. Being an artist like a painter or a musician or a computer graphics designer comes to mind. I personally experienced it by designing 3D-graphics. From my personal experience I also think you have to focus on something emotionally important to you. Something that “juices” you by just doing it and you are probably very proud on the end result as well. To get the most out of your mind you need to concentrate all your attention on exactly one thing and one thing only. It should be something that you are really interested in, your most important task at the moment. In order to deepen your focus into what you are doing you simply have to make sure that you don’t get interrupted. Set up your working environment accordingly. Close the doors, mute the phone and turn off TV/radio. Consider unplugging from the internet in order to stop you distracting you yourself by surfing somewhere. If you lose focus by getting interrupted, you lose the depth and therefore the ability to get into flow. So having a quiet space is key. Dive totally into it what you’re doing. Become one with it. To reach the state of flow you need to be totally focused at your task. Intensity of focus also creates depth. To increase intensity you already avoid being distracted from step 2. Another thing that helps here is when you are emotional and motivated about what you are doing. You will never fight for getting into flow; that’s not what I mean by intensity. It feels much more effortless. Intensity means simply that you aim for a deep connection and understanding for your task. Flow doesn’t happen in an instant. It builds gradually and takes time. To get into the Zone you need to focus your mind for at least 1/2 hour. Flow happens in the moment when your feeling of time vanishes and you basically forget about time. I personally reached flow-states after 45 to 75 minutes and stayed there for at least 2 to even 5 hours. My best quality work comes from those times. And also I enjoyed it so much that I almost got addictive to doing it. Or to be less dramatic, I just loved what I did. To really enjoy and make the most out of the state of flow you have to stay at your task until you are done. If it is a subtask of something bigger then just finish this very part of the task. This is almost more a productivity tip and the ability to focus your mind very effectively helps a lot to be productive and get your stuff done. Since you stay uninterrupted you have the chance to get the most out of yourself for a longer period of time without feeling that you have to put too much effort into it. Training your mind and develop a sharp mental focus is a key skill for success and self improvement. The ability to get into flow makes personal peak performances possible. It is a great experience and I would love to hear your own ways of getting in the flow or what you experienced being in the Zone. I get into the zone often without knowing it. I am in highschool and I was playing a soccer game in gym. My team had been waiting and when the teams playing were done and my team was up to play against the winning team. I got the ball and ended the game in 10sec. I also was playing fortnite and do not remember what I was thinking when playing. I am ok at the game and get like three kills a game. I started to play and everything seemed zoomed out. I got ten kills and 9th place. I just don’t know how to relax my mind. I have ADHD and I am kind of all over the place. When I am trying to stay focused I can’t. When I am not trying I am super focused and get stuff done. Everytime I’ve been in the zone, I’ve been wrestling. I just focus solely on the match and my comprehemsion of irrelevent things are dulled. I always experience zone when i play games or when i draw or i really want to do something….It’s like everything becomes easy…I can even copy what i see once….But i stay in zone for 30 to 40 minutes…Then i am subbed out from zone…How i can extend the limit?…. I sometimes have a similar experience while playing a first person view game team fortress 2 (like battlefield or other games if u dont know this game but with different graphics and stuff). It only happens when i have no other problems, rarely. It’s like the way it was described above. I had no sense of time, but i was completely focused on the game. I couldnt believe in my eyes or hands, but i wouldnt miss a single shot, shooting opponents in the head, without even trying. Fast moving targets, hidden targets, sometimes shooting them without knowing. Or while focusing on a specific target, others were getting in front of that target, and my hand was just slipping and clicking the “mouse” shooting enemies in the head. It was really strange because i could stay alive facing enemies face to face without dying, not missing a shot in like 20 shots in a row (untill actually dying of course). This doesnt happen to me a lot, and im trying to do achieve this more than rarely, but i just cannot. Altough it is a different experience than those of yours, i think its also related to this state “the zone”. What a great experience you had! Now that you know what to look for, I am sure you will do what’s necessary to achieve it again. For large projects set up a space for the materials and then tackle it like above. Start early, don’t leave papers and such for the night before, this only induces panic and anxiety–no flow there! For things you don’t want to do, try to couple it with something you like–a snack you enjoy, a friend perhaps, or a special treat when you are done for the day. Organize your work. Where there is clutter, there is a chaotic mind! Above all, keep reading great blogs like this one! You can pick up a lot of good tips! I’ve only been in the Zone once, it has been one year since I was in the Zone but I remember it as it was yesterday. By the way I’m 14 and I got in the Zone when I was 13. (Forgive me if my English is a little bad, it’s not my main language). So here I was sitting in class having a social studies test. I wanted to get an A so badly and it did not go well for me so suddenly I don’t know what happened but I’m starting to see all these connections and solutions to the problems. All my unnecessary thoughts disappears and time just slows down and passes un-noticed. So as the time passes I feel like I was locked inside my body and I couldn’t hear anything, no turning or writing on paper I hear absolutely nothing. I’m so devoured by writing so that I can’t remember anything, everything gets black and all I can see is the paper. I didn’t know what I had done or even written, when I was finished. I couldn’t even remember turning in the test. Next week it’s time to get our tests back and when I look at it it says an A, so I literally shouted “What! ?” out loud in the class and everyone just stares at me. So I look at my teacher and he just says “Yes”. However ever since that time I’ve been trying to get in the Zone but never succeeded, and I hope that someday I can come in it again. (Someday soon, because need to get better grades). Please give me some tips and advice. In a first time I’d like to thank you for giving a real definition of what being in the zone is. Thanks to you I realized that I already experienced it a few times in my short life. While taking exams or writing stories (which are parts of the exam) I also spend a little while trying to focus and then all I have in mind is what I’m doing and then my learning/application skills and creativity just go over the roof. I remember it clearly because it was the first time I entered the zone not only for my sake, but also because it was my best stop ever: Even the opponents supporters applauded. Once again thanks a lot for that definition of the zone, and I hope that my experience with the zone wasn’t that boring haha. I practiced moving into the Zone since I was in high-school. I became easy for me to switch ON the Zone when I had a demanding project. I was highly productive, and as you say – Time just slows down and passes un-noticed. I finished many projects this way – demonstrating good problem-solution skills, with excellent reports to Customers. But then I switched Jobs – the Projects did not have an end-time. Before, when I went into the Zone – it used to switch back to normal when I closed out the Project … now there was not closure. I would still be productive, but I’d Zone for days – sometimes without sleep. So where did it get me – a medical label of BiPolar ( heavy on the manic side ). The meds try and prevent the Zone, and they’re much shorter and less frequent now. Thanks @Leonardo: Breathing as a tool to change physiology and therefore the state is often underestimated. Thanks for the addition! Breathing deeply with the tandem is also a good way to achieve that flow state. By breathing properlly you can center your mind and energy into the now and flow better. It also helps when your skill level is a little below the task at hand, because once you’re centered, you can find new solutions to problems.